Pre-K and Kindergarten classes are located on the ground floor of our state-of-the-art building. Our environment of bright and spacious classrooms, activity rooms, and play spaces allow for children to learn, inquire, and develop. We also have a library with a large collection of developmentally appropriate books and a music room for our Kindergarten students to participate and engage in music, rhythm, motor, and language programs. The Pre-Kindergarten and Kindergarten faculty prepare their lessons using standards from the New York: Pre-K Foundation for the Common Core. Kindergarten uses the Common Core State Standards (CCSS) in math and language arts, AERO standards in science and social studies, the NCCAS for the arts, ISTE for computers, and SHAPE for physical education and health. The classrooms are attractive, stimulating and organized, and they are spacious and designed for students in this age group. 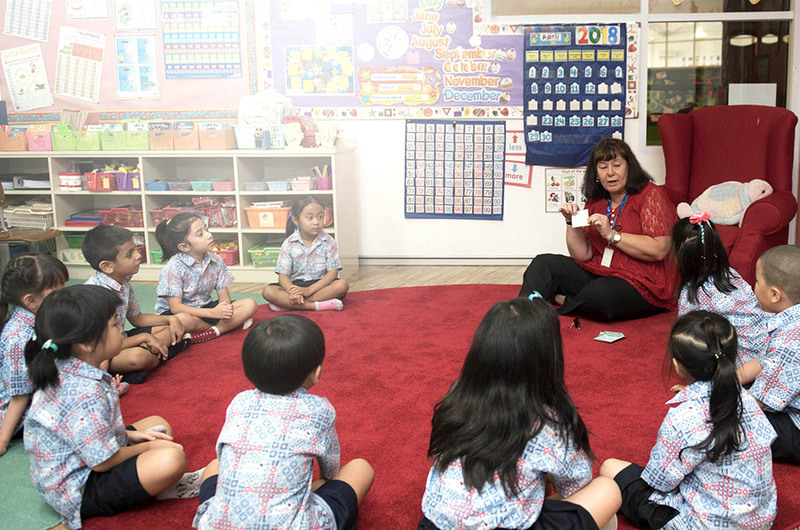 Students practice learning in both English and Bahasa Indonesia in our Early Elementary program. In our Pre-K and Kindergarten classes, students begin the work of learning reading, writing, mathematics, and social studies through exploration and play. Pre-K and K students also attend enrichment courses in art, music, physical education (including swimming), STEM, and library. Our newest Early Elementary program is STEM, where science, technology, engineering, and math are integrated into an exploratory problem-solving study. STEM learning takes place in the classrooms and also in our focused STEM rooms where students can engage in innovation and connect their academic and their personal curiosities.